If this is your first time in our office, we are happy to meet you and are pleased you have chosen us to contribute to your pet’s continued health and well being. We look forward to helping you enjoy the happiness a healthy pet can provide. This website will help explain our services and policies. Please remember we are always available with more information. If you ever have a concern, suggestion, or question just ask. To provide the best quality compassionate veterinary care. To celebrate the human animal bond. To educate ourselves and our clients so that together we can make informed decisions about your pets’ care. To treat all patients, clients, and teammates with respect and dignity. To promote an awareness of veterinary medicine and its importance to the community. To provide excellent veterinary care at a fair cost. The search for a gentle and knowledgeable veterinarian can be challenging. Our practice would not be as successful and rewarding as it is today without new patients and clients. Our best new clients are referred by our favorite existing clients. To continue this happy chain of events, we welcome your friends and family. Butler Veterinary Associates was started as Eastland Veterinary Hospital by Dr. Keith B. Harvey in 1992, with only 1 Doctor and 3 staff members. We have quickly grown in size with 7 doctors and approximately 53 full and part time receptionists, technicians, and kennel attendants. We also have added other services to better serve our clients like ultrasound and digital radiology. We moved to our current location in 1997. In July of 2012, we began our emergency services. We felt the need for an emergency clinic in Butler and the surrounding areas. We are open from 8 am to 12 midnight 365 days of the year to better serve our community. Client education is a priority at Butler Veterinary Associates. The doctors and staff are committed to providing you with a thorough explanation of your pet’s medical condition, including information regarding any diagnostic or test procedures that will be performed. We are happy to answer all of your questions. With pride, we will show you the entire facility and explain our services. Our dedication to professionalism and excellence in every phase of our hospital operation motivates us to always continue our education. All staff members attend continued education in all aspects of veterinary medicine and client service. We conduct weekly staff training sessions each Thursday from noon-1:30 pm so you can feel confident that the people treating your pet will provide the best care possible. 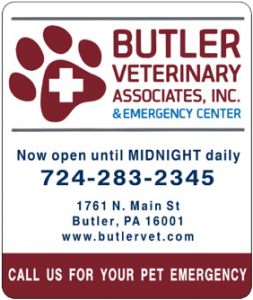 Butler Veterinary Associates’ doctors are a member of the American Veterinary Medical Association (AVMA), as well as state and local veterinary medical association.